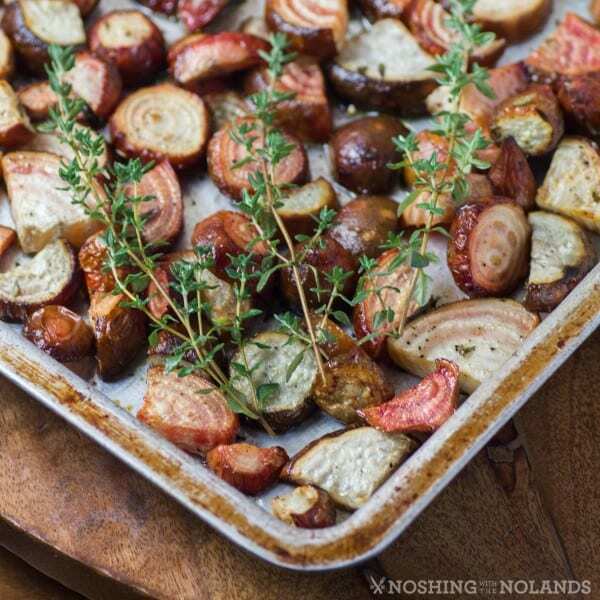 Roasted Chioggia Beets or candy cane beets are delicious with this recipe. Do you love wandering around a farmers market? I sure do and I love seeing all the fresh produce. I could go a little crazy and have to hold myself back or I am buying way too much for us to eat. It is fine when I am doing all my canning but for fresh produce I need some restrain! There was no stopping me though when I saw these gorgeous beets as I knew we could have them with any entee. Roasted Chioggia Beets or candy cane beets were a hit even with hubby and Amber’s boyfriend who don’t THINK they like beets. Roasting beets brings them to a whole new level. It let’s their natural sugars come out and shine, giving them a perfectly sweet flavor and so enjoyable with the olive oil, salt, pepper and fresh thyme. Beets also do store well so if you see these amazing chioggia type of beet grab some, they will keep for a few weeks if they are fresh to start with. You can also use regular beets for roasting too, they are just as delicious. Have you ever seen a Chioggia beet before? 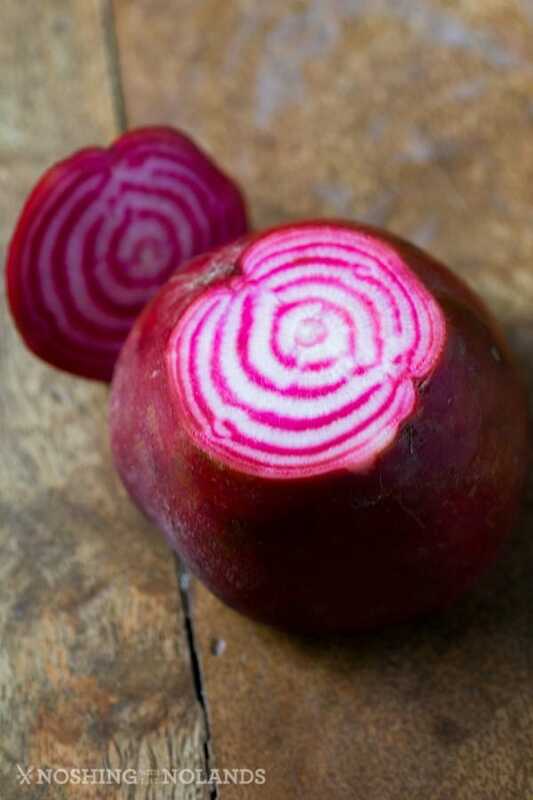 They are also called candy cane beet or bullseye beets and are an heirloom beet from Italy. Have you ever seen anything more beautiful? The colour and the gorgeous rings make this a special vegetable to behold. Once they are roasted or cooked they do mellow in color quite a bit but sure not in flavor!! The Chioggia beet can be cooked in any other way that a regular beet can be. From the farmers market the beets were all different sizes and some darker in color inside than others but that made a nice variation for roasting. 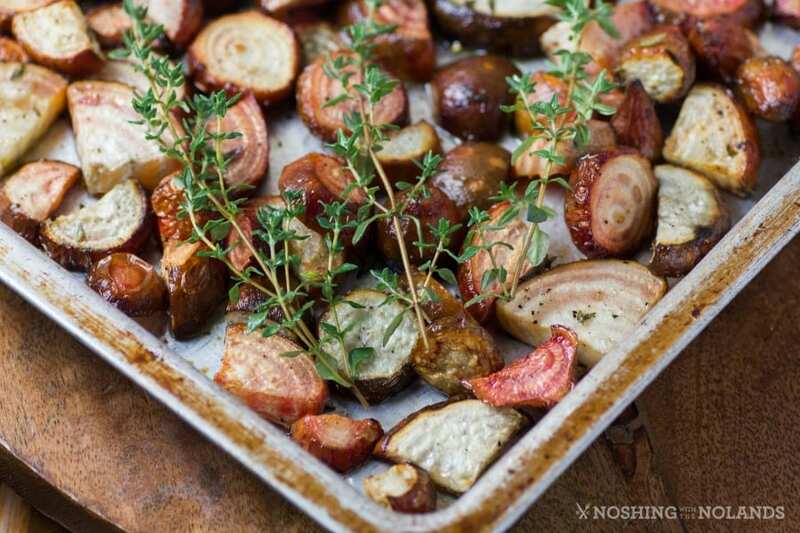 Roasted Chioggia Beets brings out more of their natural sweetness and flavor. This is a fantastic side dish for many entrees. Preheat oven to 400F. Slice and chop beets into equal sizes and place on a rimmed cookie sheet. Toss with the oive oil, thyme and salt and pepper to taste. Bake for 30 min. until golden and cooked through. Serve immediately. The first time we had these beets I made the mistake of boiling them which left them a very pale pinkish colour! Thanks for posting this so I can prepare them and keep the pretty stripes. They still do fade quite a bit, some even turning white but the vibrant ones maintain some of their pretty stripes still with roasting. I hope you do find them and they convert you to a beet lover. They sure are gorgeous!! I’ve never had this kind of beet. Whenever I think of beets, I think of the stains they leave behind. Maybe that’s why I rarely make them. These do look delicious. I’ve never tried anything like this before but it looks great. Not sure my kids would go for it but oh well more for me! I’d love it for sure. I am not a huge beets fan, but I’m always willing to try them again. These look delicious the way you made them so I may have to try them out. I just love beets. I can’t wait to try them this way. I stumbled and yummed this. As a vegetarian I am always on the hunt for great veggie side dishes and this looks divinely DELISH and pretty simple to prepare! Thanks for the recipe! I haven’t had these types of beets before. They do look good. I will have to see if I can find any in the area. I love roasted beets, but have never heard of that variety before. I’m definitely going to see if I can find them locally since they look amazing. Thanks for sharing your awesome photography and recipe. Yum! I do not think I have ever tried these before, but they look delicious! I have to try these! Yum! There are some things that intimidate me to cook and beets are one of them. Thanks for the step by step instruction. I’m going to give it a go! I was never a fan of beets but recently I’ve been indulging in them. My mom makes a mean beet salad! So yummy! Love, love, love farmer’s markets. Love beets, too. But have never seen or heard of Chioggia beets until your post. Will definitely have to roast some and give them a try. Thanks! My husband loves beets, but i’ve never seen this type. You’re right about how pretty they are. I’m on a mission to find some now. I am always looking for new recipes to try. This looks so delicious. I am excited to try Roasted Chioggia Beets. Roasted Chioggia Beets look so delicious and easy to make. I will have to get the ingredients I need to make some this weekend. 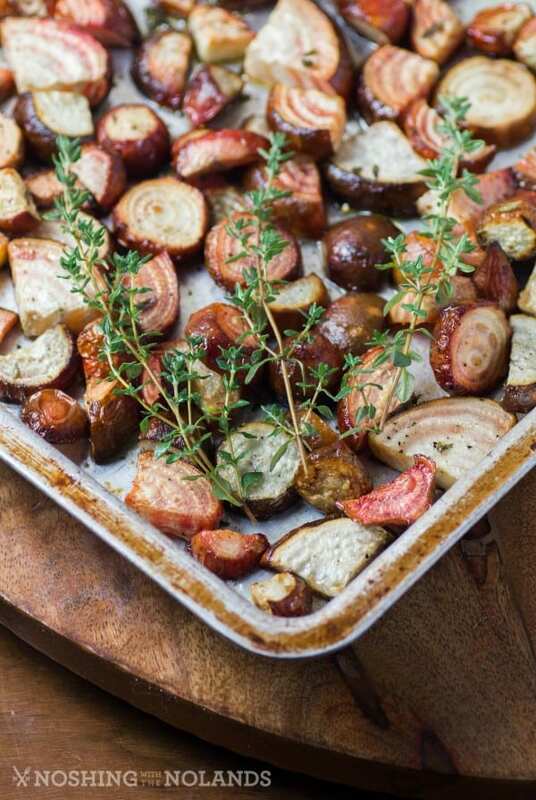 I will have to try this Roasted Chioggia Beets recipe. I know it will be a big hit with my family. This recipe is so delicious. I just made Roasted Chioggia Beets this week and my family loved them. These look really delicious. I would love to make these for my family as well. I have never really eaten beets that much, but these look amazing. I am going to have to give them a go and see if my family likes them. Do you have to peel these before roasting them? I trim them if needed but don’t peel them.